Western blot analysis of extracts from A-431 cells, untreated or treated with hepatocyte growth factor (HGF), using Phospho-Met (Tyr1234/1235) (D26) XP® Rabbit mAb (Biotinylated) and developed using Streptavidin-HRP #3999. 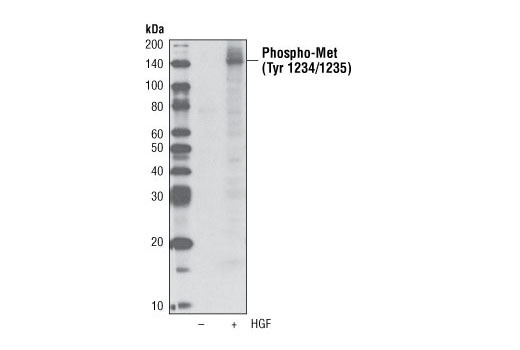 Phospho-Met (Tyr1234/1235) (D26) XP® Rabbit mAb (Biotinylated) detects endogenous levels of Met only when phosphorylated at Tyr1234/1235. This antibody may cross-react with overexpressed tyrosine phosphorylated Src proteins in western blot analysis. Monoclonal antibody is produced by immunizing animals with a synthetic phosphopeptide corresponding to residues surrounding Tyr1234/1235 of human Met protein.